Dimensions 0 by 7.80 by 9.40 in. Computer networks; Examinations; Study guides. Shon Harris, CISSP, was the founder and CEO of Logical Security LLC, an information security consultant, a former engineer in the Air ForceÃ¢ÂÂs Information Warfare unit, an instructor, and an author. She authored several international bestselling books on information security which have sold over a million copies and have been translated into six languages. Fernando MaymÃÂ­, Ph.D., CISSP, is a security practitioner with over 25 yearsÃ¢ÂÂ experience in the field. He is the author of over a dozen publications and holds three patents. His awards include the U.S. Department of the Army Research and Development Achivement Award and he was recognized as a HENAAC Luminary. About: A fully revised edition of the #1 CISSP training resourceThoroughly updated for the latest release of the Certified Information Systems Security Professional exam, this comprehensive resource covers all exam domains, as well as the new 2015 CISSP Common Body of Knowledge developed by the International Information Systems Security Certification Consortium (ISC)2Â®. About: A complete, up-to-date revision of the leading CISSP training resource from the #1 name in IT security certification and training, Shon Harris Fully revised for the latest release of the Certified Information Systems Security Professional exam, this comprehensive, up-to-date resource covers all 10 CISSP exam domains developed by the International Information Systems Security Certification Consortium (ISC2). About: Get complete coverage of the latest release of the Certified Information Systems Security Professional (CISSP) exam inside this comprehensive, fully updated resource. 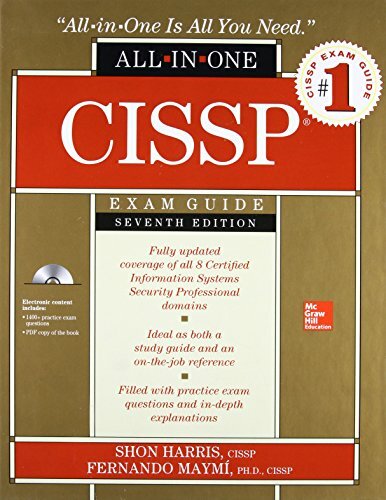 About: Covering all aspects of the Certified Information Systems Security Professional (CISSP) exam, a professional handbook furnishes a detailed overview of the latest security trends and methodologies; discusses such topics as continuity planning and disaster recovery, access control, and security management practices; and provides a CD-ROM containing simulated study questions and answers.